recognized by the native people as a symbol of their highest god, Huitzilopochtli. Thus, the lady comes forth hiding but not extinguishing the power of the sun. She is now going to announce the God who is greater than their sun god. The Lady is standing upon the moon. Again, the symbolism is that of the woman of Rev. 12:1 who has the "moon under her feet". The moon for the Meso-Americans was the god of the night. By standing on the moon, she shows that she is more powerful than the god of darkness. However, in Christian iconography the crescent moon under the Madonna’s feet is usually a symbol of her per- petual virginity, and sometimes it can refer to her Immaculate Conception or Assumption. The eyes of Our lady of Guadalupe are looking down with humility and compassion. This was a sign to the native people that she was not a god since in their iconography the gods stare straight ahead with their eyes wide open. ..."
During a visit to Mexico earlier this year, Sec. State Hillary Clinton asked who painted the image on the nearly-500-year-old tilma, which is made of cactus fibers. 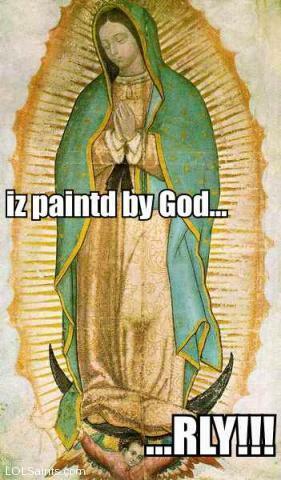 The feast day for Our Lady of Guadalupe is December 12. She is the patroness of, among other things, all of The Americas. At one point someone tried to destroy with a bomb. Submitted by Contra on Fri, 12/17/2010 - 10:49am. Submitted by Marko (not verified) on Thu, 12/30/2010 - 2:52pm. Sorry - we're actually working on revamping the site a little bit, and I've been sidetracked with a few other projects. The new year will see some new saints—that's for sure! Submitted by lolsaints on Thu, 12/30/2010 - 2:59pm.